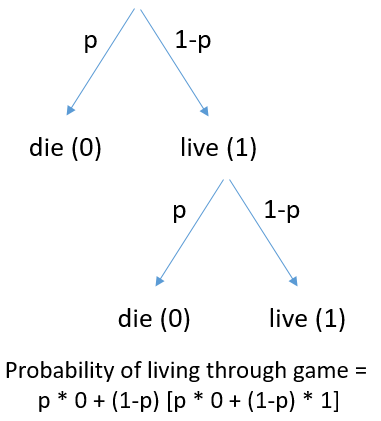 With p as the probability of dying on one shot, this figure shows how to get the probability of living through the game. Imagine being obliged to play Russian roulette – twice (if you are lucky enough to survive the first game). Each time you must spin the chambers of a six-chambered revolver before pulling the trigger. However you do have one choice: You can choose to either (a) use a revolver which contains only 2 bullets or (b) blindly pick one of two other revolvers: one revolver contains 3 bullets; the other just 1 bullet. Whichever particular gun you pick you must use every time you play. Surprisingly, option (b) offers a better chance of survival. We discuss a general theorem implying, with some specified caveats, that a system’s probability of surviving repeated ‘demands’ improves as uncertainty concerning the probability of surviving one demand increases. Nonetheless our behavioural experiments confirm the counterintuitive nature of the Russian roulette and other kindred problems: most subjects prefer option (a). We discuss how uncertain probabilities reduce risks for repeated exposure, why people intuitively eschew them and some policy implications for safety regulation. We can see how many people would think the choice between (a) and (b) doesn’t matter. Naively one might think that 2 bullets leads to the same probability as choosing blindly between 1 and 3 bullets. But this is not true. See the graphic above and plug in different ps. 2x**2 < (x+y)**2 + (x-y)**2, unless y=0. 2x**2 < 2x**2 + 2y**2, unless y = 0. Your example has x = 4 and y = 1. It turns out, in line with the suggestion in the above abstract, that this result is counter-intuitive and people are not generally sensitive to the effect. Also, cited in the Kutzner et al. paper is an earlier excellent paper by Rode, Cosmides and Toby which makes a related argument and ties it in with the problem of both ambiguity aversion and ambiguity loving. The problem becomes much more obvious if you consider the choice between a gun with three bullets and the 50/50 chance of getting a gun with 6 bullets or zero bullets. In the first case, the probability of survival is quite low (25% = 50% * 50%). While the probability of survival in the second case is quite high, 50%! Interestingly enough the insight is even more pronounced if you are not allowed to spin the chamber after every trial, i.e. where there is path dependence in choices. Counterintuitive probability problem of the day was written on May 24, 2017 and filed in Encyclopedia,Gossip,Ideas,R.